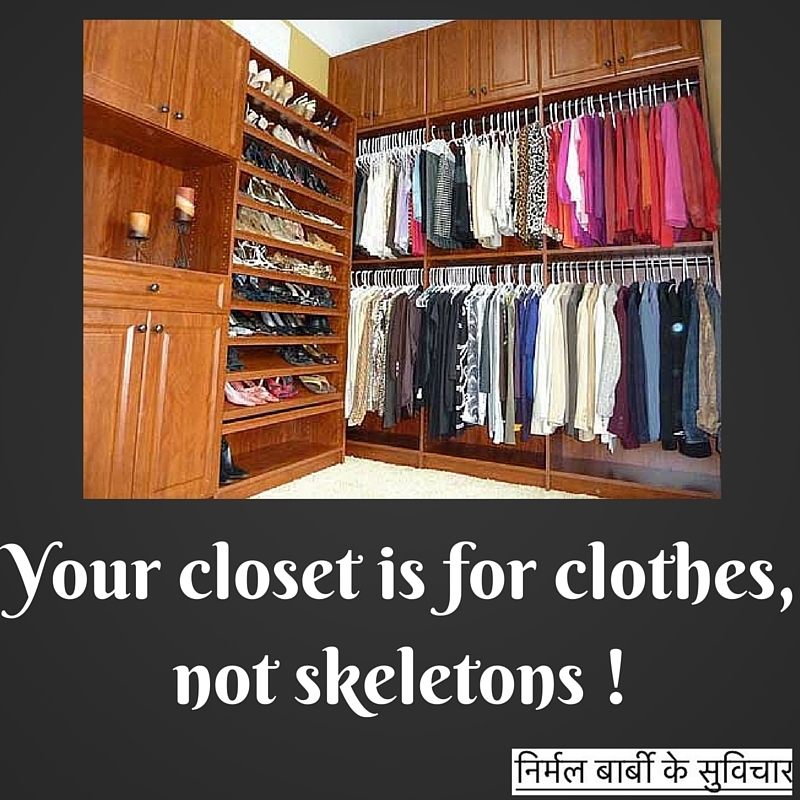 Bindu, I have some clothes in my closet that are skeletons of my younger, thinner, more limber self. I still love them, but they no longer like me. Posting them on Craigslist, if anybody cares to see. I bought most of this stuff when I was travelling a lot, to Bali, China, Singapore, and South America, among other places. I specialized in light, locally crafted things, that I could bargain for, like local costume jewelry and lightweight clothes. A lot of gifties bought in local grocery stores. The grocery stores were my favorite places to shop. I’m calling myself Leo Wheels (and deals). Selling off the back of my truck all the clutter I can’t bear to throw away, because it would be useful to the right owner. Planning to do a blog on it. What do you think? I meant skeletons as in secrets. But these kind of skeletons are also to be cleared. Katherine, I regularly clear our things I don’t need, clothes, boxes, sheets etc and give it to this organization called “Goonj”. The founder is a very dear friend and recently was awarded the Ramon Magasaysay award. Goonj recycles and redistributes across India. Please check their website http://www.goonj.org. Awesome work and it helps to reach things you don’t need to those that need them. I knew what you meant. I’m addressing a higher level concept, to-wit, individuals cleaning out their own closets, literally and figuratively, and look for value in the things they find. They shouldn’t need middlemen, who take credit and get the profits, to convert trash to treasure. Individual profit is a good thing, despite what the non-profits and other government-supported dependency-creators say. Katharine, completely get your point. And “govt-supported dependency-creators” is a great way to put it :). Am all for individual profit. Am also for not hoarding and having too much more than what you need because in some ways I feel we contribute to the scarcity that is around the world by taking a lot more than what we need. I need to write about this too … thanks for the thought starter.